Note that for sea surface temperature, validation results are available both with respect to data from drifting buoys and data from a high-quality satellite product. All values for biases result from subtracting observed values from model results. Hence, a model will have a positive bias if e.g. model temperatures are higher than the corresponding temperature observations. 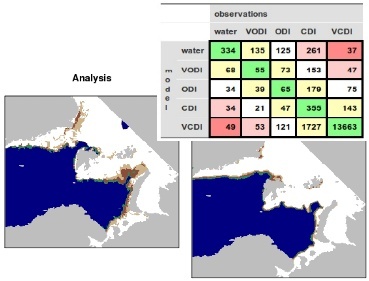 Validation results from CMEMS global ocean circulation model, in order to provide product quality information that is supplementary to the results from CMEMS-ARC. Processing and computation of metrics are performed identically to the implementation for the ARC product. A validation report for the real-time V1 forecast system is available here (pdf). Results from a comparison between version V0 and version V1 of the ocean circulation model is available here.